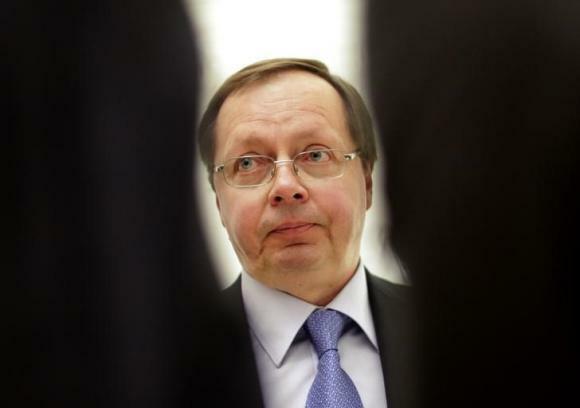 Russia’s ambassador to the Organization for Security and Cooperation in Europe (OSCE) Andrey Kelin, attends a news conference after meeting of OSCE permanent council, in Vienna March 3, 2014. MOSCOW (Reuters) – Russia’s envoy to the European security watchdog OSCE urged the United States and Europe on Thursday to stop supporting the “party of war” in Ukraine and warned “catastrophe” could result, Interfax news agency reported. “I would like to appeal to the states that have influence on Kiev’s leadership, most of all to Washington. It’s time to stop indulging Ukraine’s party of war,” said Russia’s OSCE envoy, Andrei Kelin. Russia has increasingly blamed the United States and NATO for the flare-up in violence in eastern Ukraine. The West accuses Moscow of feeding a pro-Russian insurgency with guns and soldiers. Russian President Vladimir Putin said this week the Ukrainian army itself was a legion of NATO sent to geopolitically contain Russia. “It’s time to stop covering (Kiev’s) inhuman actions, it is unacceptable to push (them) toward the continuation of war in eastern Ukraine,” said Kelin. Russia denies accusations it is sending money, arms or weapons to eastern Ukraine, where a pro-Russian uprising began months after Ukraine’s Moscow-backed President Viktor Yanukovich was ousted by street protests.